I occasionally contribute to this blog but have been absent for some time now. You see multi-tasking is the buzz word today but I am hopeless at multi-tasking; for me it has always been one job at a time. I sort of get stressed when I have to do too many things at a time. Recently therefore when my co-blogger and brother Aroop Bose told me that it is time I made a contribution I thought, “Goodness me! I already have my own food blog -- It is tasty ma! and I am also working on a film blog which I plan to launch shortly and not to mention my household chores” …. Even as these thoughts crossed my mind my eyes fell on the Bournville press ad. however like the current one, a novel way of emphasizing on quality and the press ad is an excellent support for the TV commercial. Usually in any ad it is the tagline which attracts my attention I find reading body copy quite tiresome. In case of Bournville their tagline You Have To Earn A Bournville instantly attracted my attention when I first heard it but surprisingly when my eyes caught sight of the press ad I found myself reading the body copy with great interest. Read it and decide for yourself, it is quite interesting particularly the intelligent use of pun on the word bean. So while you readers decide whether you agree with me or not I think I will treat myself to a Bournville after all I have ‘EARNED IT’ haven’t I? After all I managed to finally find the time to contribute to this blog. 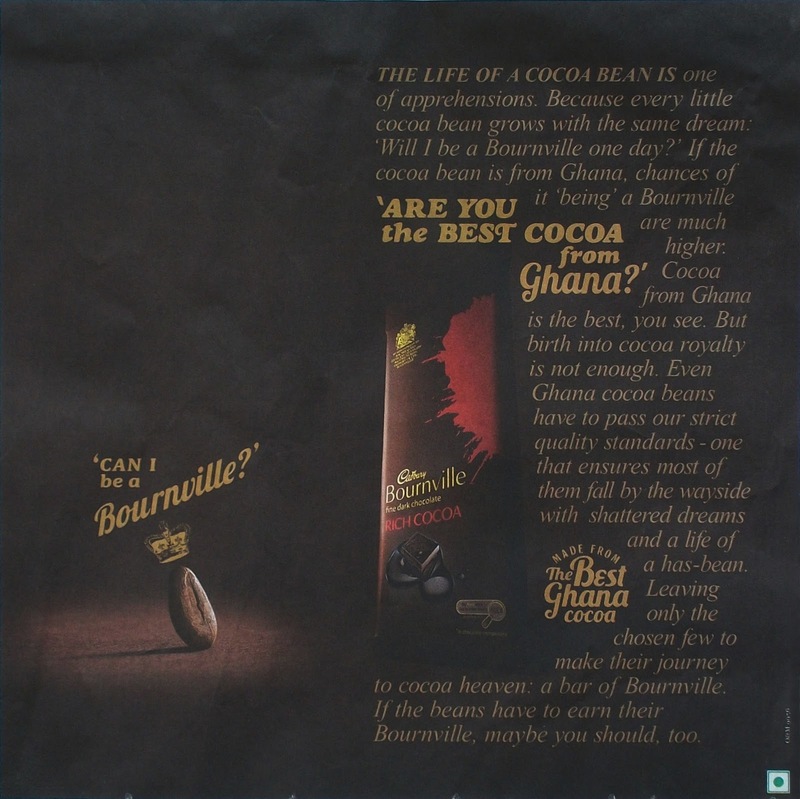 The purpose of the campaign is to draw attention and emphasize the superiority of Bournville over ordinary chocolates. Both the TV commercial (TVC), crying cocoa bean, and the press ad have tried to educate the consumers as to what makes Bournville a superior chocolate. The earlier TVC (giant bird carrying the man) merely announced the superiority of Bournville without giving any strong reasons but the current TVC explains the reason why while the press ad ably supports the TVC. Bournville is a superior product and is targeted at the discerning consumer who is prepared to pay a higher price for better quality, the target consumer needs to be given a good reason for trying out Bournville; to my mind the new campaign (crying cocoa bean) has achieved this very effectively. The TVC educates through excellent creativity and humour without showing anyone eating Bournville. The press ad does not use any model; the product is the hero here. The press ad is simple and appealing so much so that one feels the urge to read the body copy. A real mouth-watering ad campaign from Cadbury.